Since taking the reins at Moschino, Jeremy Scott has maintained a perpetual need to surprise and delight our inner child. It's this impulse that has enabled Scott to deliver another unparalleled collection for Spring/Summer 17'. Dramatic, burgundy velvet curtains framed the stage as the fashion world buzzed, wondering what whimsy we were about to behold. The show opened with Gigi Hadid wearing a gown with a print motif rendering her a paper doll ready to be adorned with the most sumptuous of designs. What followed was a triumph in ingenuity, engineering and imagination. Model after model showcased sketches that literally jumped from the page onto the models. 2D illustrations were screened onto fabrics and constructed to keep their form on the models, like life size paper doll clothing complete with tabs! Iconic Moschino looks from the teddy bear shoulder dress to the leather and logo clad vixen were sprinkled among the classically glamorous paper doll looks. The construction kept the pieces in a perpetual state of static motion, so that even when standing still, you would be surrounded in glorious movement. And the fun did not stop there!! Bags and accessories followed suit with attached tabs, even the stilettos! Stand out pieces were a black dress with a tromp l'oeil trench draped on one shoulder worn by real life doll Anna Cleveland and a stunning sky blue gown, worn by Irina Shayk, that was so full of regal glamour it could serve only as the shows closing piece. 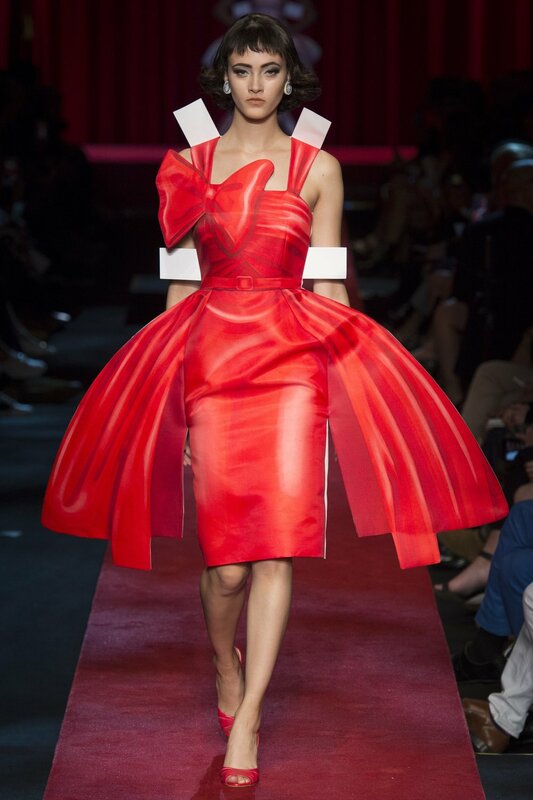 My personal favorite was the capsule collection within the presentation, something Moschino has become known for. This 'capsule' collection, which was available to the public immediately following the show, lived up to its name! Prescription pill bottles dresses, capsule print backpacks, and pharmaceutical motifs were made instantly chic. Giant pill bottles became small purses and phone covers! Pill blister packs yielded to become purse cover flaps and, my must have piece, an envelope clutch! A t-shirt emblazoned 'Just Say Moschi NO' made me laugh out loud and I immediately knew I needed it in my life! Teased with the idea of fashion as a drug, my heart raced with excitement over these pieces and I was reminded, that like all fashionistas, I do it for the rush. Photo by Yannis Vlamo courtesy of Vogue. For more information about Jeremy Scott and Moschino please visit www.moschino.com/us. 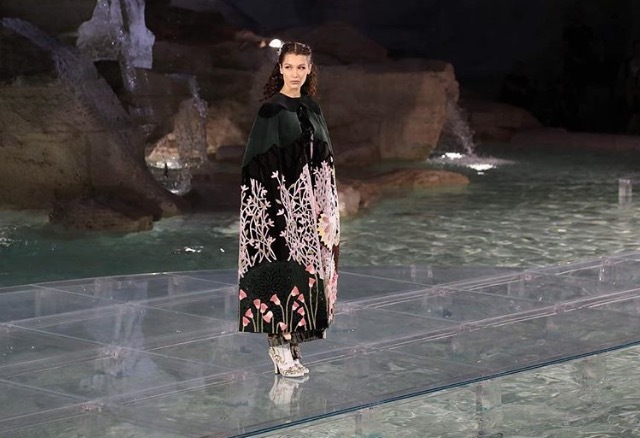 Fendi celebrated its 90th birthday in the Eternal City this evening with an haute-couture fashion show at the famed Trevi Fountain. Super models Bella Hadid and Kendall Jenner graced the glass runway like goddesses as Kate Hudson watched from front row. The house has maintain its headquarters in Rome throughout its success and this epic gesture was the perfect ode to this magical love affair!